Synopsis: In the summer of 2000, Christopher Lambert drew a straight blue line between Le Havre and Rome on a map of Europe when eighteen months short of his 70th birthday. 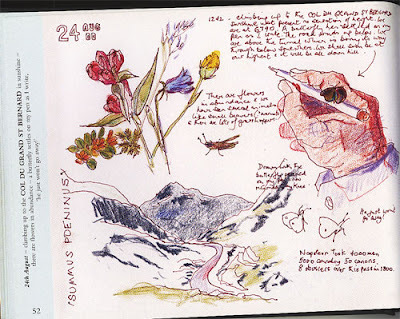 He then set off with his all leather Brasher walking boots, a small rucksack, a couple of pens, some watercolour pencils and a sketchbook journal. 1,075 miles and 71 walking days later he arrived in Rome having taken a page each day to sketch and write about what he saw on his trip. Summary review: HIGHLY RECOMMENDED This book is a joy for all those who sketch on their travels. It's both an inspiration to improve one's own sketches and a gentle reminder of how to slow down and reflect on life and the pleasures of our surroundings and all we encounter on our travels. If you find his writing a bit small I recommend a magnifier as the book is a facsimile which is the only way to experience 'as if' looking at the original book. one of the very best travel journals I have ever seen - sets a standard to aspire to! anybody who likes travelling at top speed! Technical data: Current Publication Date: July 7, 2006 It would appear that the book may have been reprinted in 2006 and that the original publishers are no longer involved. The link at the top is to the amazon.com 2006 book. The link at the end is to the amazon.co.uk 2004 version. Paul Klee once explained that "a drawing is simply a line going for a walk". 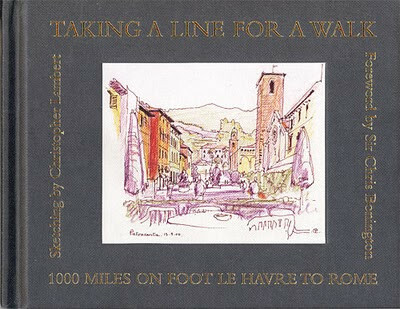 Christopher Lambert, the creator of this facsimile sketchbook, developed a taste for long distance walking when, on his retirement, he walked 440 miles along five ancient footpaths across southern Britain to his new retirement home in Devon. For the Millennium he thought he'd like to try one of the pilgrim routes across Europe. Consequently, in July 2000 he set off carrying a pilgrim's passport - a letter of brotherly greetings in Latin from the Anglican Provost of Portsmouth Cathedral to Pope John Paul in the Vatican in Rome. On his trip he averaged just over 15 miles each walking day overall, although this inevitably varied along the route across France, through Switzerland, down through northern Italy and the 'thigh' of Italy to Rome. En route - and along his straight line - he visited Honfleur, Fontainebleau Forest, the Canal de Bourgogne, Dijon, Lausanne and from there along the ancient pilgrimage route, the Via Francigena, through the Grand St. Bernard pass across the Alps to Aosta, Lucca and Siena before reaching Rome. The author is a former architect and it's evident that his working life enables him to take him scenes involving buildings with an ease which others can only aspire to. His eye takes in and quickly absorbs the key features of complicated architecture. I loved the way he tells himself off when he's done something overly complicated - giving himself injunctions to simplify. Overall, despite what he says below, his style is very pleasing - being loose and unfussy. Some of the very simplest sketches have the greatest impact. leading art store blogs. I'm trying to keep this limited to leading art stores and/or blogs which are particularly good at explaining art materials rather than just annoucing their latest sale or unmissable offer! Does anybody know of any more leading art store or art manufacturer blogs which they would recommend for this blog's blogroll? 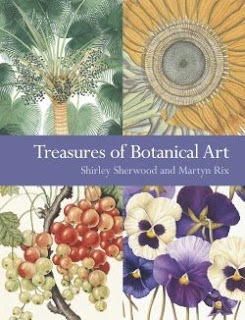 Synopsis: Written by two experts in botanical art and published as the catalogue of the inaugural exhibition of the The Shirley Sherwood Gallery in Kew Gardens, the first gallery in the world to be dedicated to year round exhibitions of botanical art. The book provides an overview of the richness and endurance of botanical art and the most significant artists from the 1600s through to contemporary artists. The book focuses on the botanical artworks in the exhibition in terms of their place in the history of botanical art and in relation to the plants they portray. Images are largely organised according to themes and so paintings completed many years apart are presented side by side. 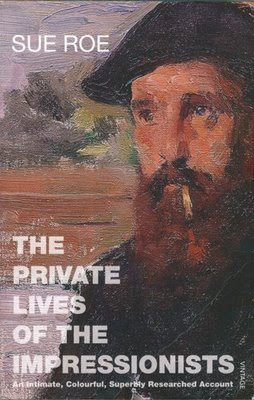 At the end of the book are biographies of all the artists whose work is reproduced in the book. the origins, history and relevance of botanical illustration. extensively illustrated; features some 200 illustrations of paintings and drawings from both the Kew and Shirley Sherwood collections. each illustration is annotated with particularly thorough captions, with artist's details, dimensions of the paintings, medium and material, and the nature of the plant shown. 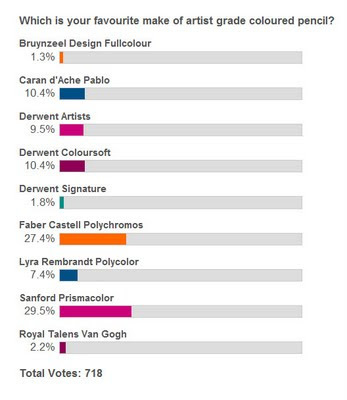 indices for both plants and artists could be better. This book is HIGHLY RECOMMENDED. It proved very popular on publication and I'm sure it will become a landmark publication over time. 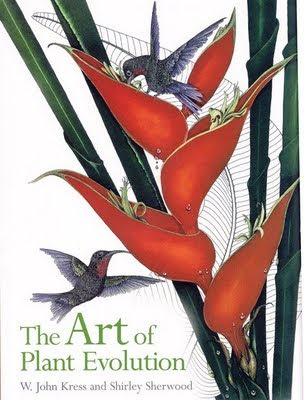 This review was first published - in a different format - on Making A Mark on Monday, April 21, 2008 - see Treasures of Botanical Art - a recommended read. This post also includes a review of the exhibition and some of the images of the work on display. Martyn Rix is the editor of Curtis's Botanical Magazine, which is the longest running botanical periodical in the world. 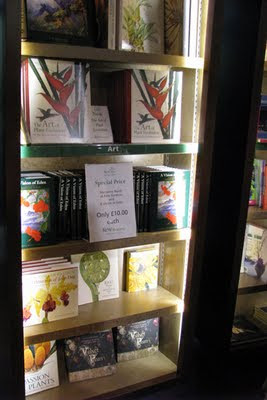 Kew Publishing is the publishing house of the Royal Botanic Gardens, Kew. It produces over 20 new titles each year and aims to inspire and educate people about our work and to make available Kew’s unique heritage and resources, knowledge and cutting edge expertise to as wide an audience as possible throughout the world. 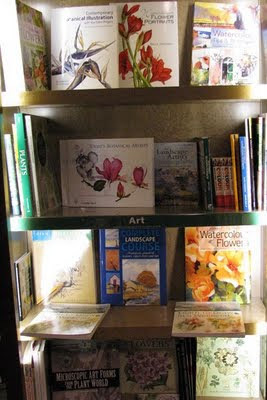 Botanical Art - Resources for Artists - many links of interest to botanical artists plus it contains a bookmark link to this book review and links to items about the new gallery and both botanical artists in history and contemporary botanical artists. 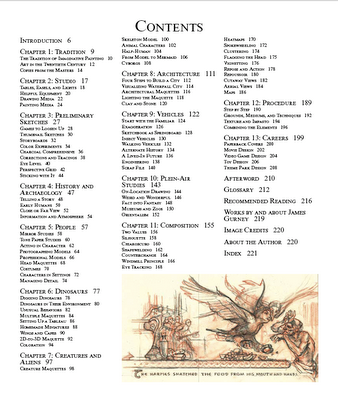 Synopsis: This book has been described as the ultimate reference for fans of science fiction and fantasy illustration. Imaginative Realism links traditional techniques with contemporary visualisation. This is NOT a book about the use of digital tools. Instead the focus is on the use of plein-air studies, models photographed in costume, maquettes, models and tableaus. He also demonstrates the use of thumbnail sketches, storyboards, charcoal comprehensive drawings, tone paper studies and a variety of approaches and techniques relevant to composition. 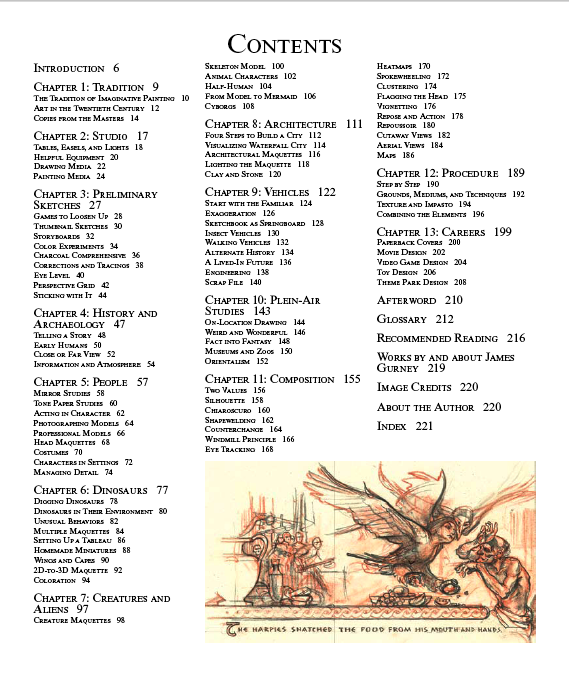 This vast number of topics are typically covered in double page spreads with dense but succinct text and relevant images at various stages of development. The book also includes a useful section on careers and a detailed glossary. On publication this book became the #1 art instruction book on Amazon. A month after publication it holds on to the #1 slot in art books about Realism. The reason being that this book sets a very high standard for all art instruction books as it is jam packed full of useful content which is both very accessible and highly informative. The bias is towards Gurney's normal fantasy art subject matter but the principles are applicable to all painters who create works which involve some element of imagined realism. This book is so good I'd recommend that any aspiring fine artist buys it just for Chapter 11 which deals with composition. The approaches to developing a composition and the various devices discussed in the book are also ones which are important to the education of any artist wanting to paint in a realistic way. They also go way beyond what gets highlighted when composition gets discussed in most forums and books. James manages to be is very informative about past practices of leading illustrators as well as providing very clear explanations about traditional concepts and his own particular techniques developed over many years in his very successful career as a creative artist. In doing so, he maintains a very accessible writing style of the type used by the very best teachers. I suspect some will hope this book will be published as a hardback as I think this will become a standard reference book and be used for many years to come. extremely well written and very accessible. This book will appeal to all ages. You can access much of this material on his blog - but if you find that useful you'd regret not buying this book! I suspect this book will be very well used by some artists who might value the option of a hardback as an alternative. figurative artists who would like to create imagined scenes - even if they don't involve dinosaurs! dedicated digital artists might think this book has little relevance - but they'd be wrong! I've been a long-time follower and reader of James Gurney's blog Gurney Journey. I also regularly highlight his blog posts in my weekly Sunday post "Who's made a mark this week?" Indeed sometimes it feels like I'm featuring him every week! One of the reasons for that is James is so generous in sharing his expertise as an artist and illustrator. I've known for some time that he had a book planned and consequently it was great to be able to get hold of it, read it and now write this review. 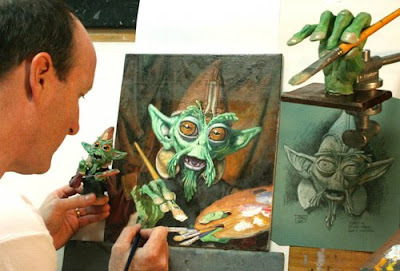 This long time artist and author produces what he wants to do the way he wants to do it. He's writing about what he knows, he writes from a position of many years expertise and he shares an absolutely amazing amount of content and material. It's very important to note that, at a time when many publishers of art instruction books are finding yet more ways to regurgitate existing content that they've already paid for into yet another format or cover, James Gurney confounds all the myths about the publication of art books. He tackles complex topics - and renders them easy to understand. He creates a book which appeals to those starting out and those who are experienced in this field. He packs a huge amount of information into one book rather than delivering a publication which is very thin in content terms. He tackles traditional concepts without any sense of the 'same old same old'. I do hope some of the publishers take note and many thanks to Andrews McMeel Publishing for letting James do what he does best! A lot of what is in this book I'd already read on Gurney Journey. This has given James the opportunity to refine some of his material as prior publication on his blog means he's already got a very good sense of what interests his readers and devotees. I really enjoyed seeing it all again in book form and there's something about having it all together in a logical sequence which I think creates an overall sum which is greater than the parts. 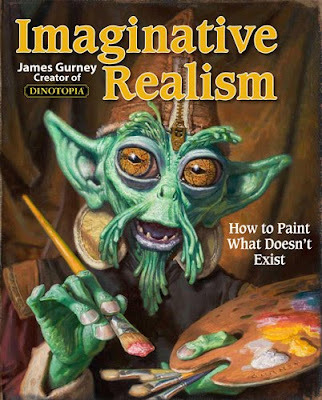 You should also read Charley Parker's review on Lines and Colors - Imaginative Realism: How to Paint What Doesn’t Exist. This one will particularly appeal to the fantasy artists and illustrators reading this. Online Store: The website is not really set up for dealing with online orders from people from places outside France. It's more along the lines of providing an online catalogue. I noted that the minimum order is 50.00 euro. Orders should be addressed and signed and confirmed by a deposit or the number of your credit card. The postage and packing are charged to the customer. Goods travel at the risk of the recipient. 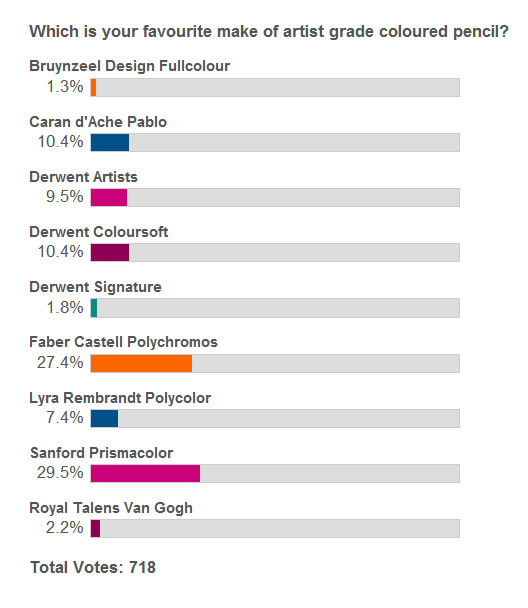 Of interest to: Artists who specialise, like me, in the use of dry media - pastels and pencils. Also of interest to those who would like to purchase pigments. 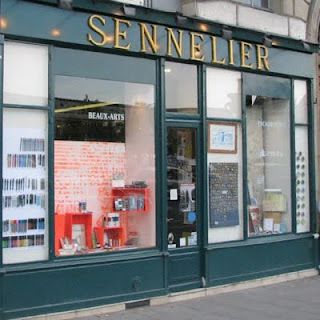 If Quai Voltaire is a problem to get to, there are two other Sennelier shops in Paris at Magasin Sennelier 4 bis, rue de la Grande Chaumière 75006 Paris and Magasin Sennelier 6, rue Hallé 75014 Paris. Summary: A traditional shop which has been around for over 120 years and is likely to be around for a long time to come. I don't think you'll find a bargain but you will see the complete range of some products which are difficult to see elsewhere. Le spécialiste de la restauration, des toiles à peindre, des chevalets, des papiers du monde, de la calligraphie mais aussi de la sculpture, de la gravure... et de la la couleur. Gustave Sennelier set up his art shop at 3 Quai Voltaire in 1887 - some 122 years ago! You can read (in French) about the history of the firm and the shop. Since that date, many an artist from countries other than France have found their way to its front door. If you don't have an opportunity to visit, you can see a slideshow of all the photos I took in the Sennelier Shop at 3 Quai Voltaire in Paris on Flickr - with explanations of what each picture is showing. 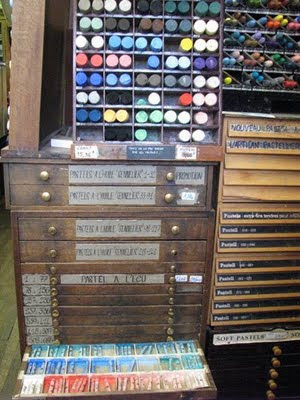 The shop includes more of a focus on dry media and pigments, soft pastels, coloured pencils and pencils than most. For UK readers I'd liken it to Cornelissens in London in terms of layout and style - wood floors and a limited presence of modern product display units. One got the impression these were only used if they were more effective than alternatives. Personally speaking I like to see a shop which specialises in pastels with old fashioned pastel drawers - and these were of course present! I paid a visit to see the complete Caran d'Ache Luminance 6901 range on display. I like the pencils a lot but I don't like the price and don't quite know what possessed me to pay €3.95 each for several of them! I did notice that the shop price was significantly more than the price quoted on the Sennelier website. This is a shop for all coloured pencils fans as it also stocks the complete range of Faber Castell Polychromos, Caran d'ache Pabo as well as Neocolor, Cretacolor and Aquamonolith. I wasn't paying attention to the paints on offer but the store does offer a good range of good quality paints - for oils, acrylics an watercolour paintings - plus associated media and brushes. 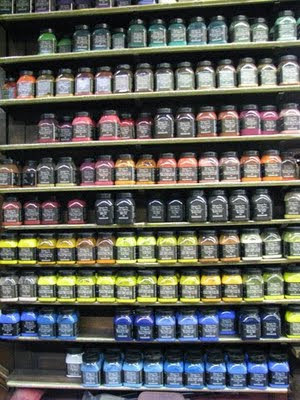 The wall of jars of pigments is simply stunning. The website is written in French and small parts of it have been translated quite badly (automatically?). I wouldn't feel confident about trying to order anything from the shop using the website but if you're good at French or are prepared to persevere I'm sure it's possible. The minimum order that they will deal with is €50. Beginning Dec. 1, bloggers, Twitterers and many others who write online product reviews must disclose the receipt of free merchandise or payment for the items they write about. The basic principle which underpins this blog is that all all the reviews which appear here should be independent. I am sent review copies of books by publishers or authors and samples of art materials by suppliers of art materials but I have no financial relationship with those suppliers or any art shop or art bookshop. I will always declare if I have any sort of affiliate interest in relation to a product or service under review and I'll also declare whether I was sent a product as a sample. I don't think I need to take any action. There are clear issues about how to distinguish between ordinary people who write about products they use in an 'everyday' way and those who provide endorsements with a view to earning money from their blogs. It's been an issue that has always seemed to me to be one which is best addressed by ALWAYS being open and upfront about any products/books/items I'm sent to review. I don't give positive reviews simply because I'm sent something but I really wouldn't want people to think that a positive review is the result of getting a freebie!!! Overall, I say what I think - but try to be fair. In relation to negative experiences I notify a manufacturers if a sample product has failed to perform - as I've done just recently. I then seek a replacement to ensure that my review is not distorted by what might be a 'one-off' malfunction. It happens. The Guide was last updated in 1980 so this is a major and important change. It's specifically aimed at ensuring transparency in dealings as much advertising now moves away from traditional channels and towards social networking sites. Here are some links providing more information. The revised Guides specify that while decisions will be reached on a case-by-case basis, the post of a blogger who receives cash or in-kind payment to review a product is considered an endorsement. 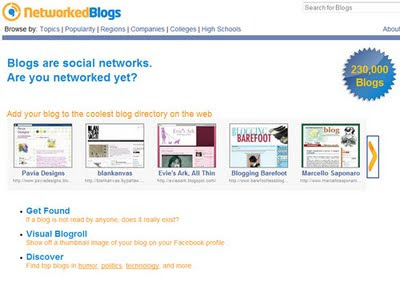 Thus, bloggers who make an endorsement must disclose the material connections they share with the seller of the product or service. Likewise, if a company refers in an advertisement to the findings of a research organization that conducted research sponsored by the company, the advertisement must disclose the connection between the advertiser and the research organization. And a paid endorsement – like any other advertisement – is deceptive if it makes false or misleading claims. sponsoring advertiser. The party whose opinions, beliefs, findings, or experience the message appears to reflect will be called the endorser and may be an individual, group, or institution. (c) The Commission intends to treat endorsements and testimonials identically in the context of its enforcement of the Federal Trade Commission Act and for purposes of this part. The term endorsements is therefore generally used hereinafter to cover both terms and situations. (d) For purposes of this part, the term product includes any product, service, company or industry. (e) For purposes of this part, an expert is an individual, group, or institution possessing, as a result of experience, study, or training, knowledge of a particular subject, which knowledge is superior to what ordinary individuals generally acquire. Summary: This is a really bookshop to go to if your area of interest is largely focused on commercial art in all its aspects as it has particularly good sections for those involved in graphic design and illustration. Also lots and lots books for photographers. I don't get involved with illustration, graphic design or commercial art but I do love looking at some of the books which relate to that field. 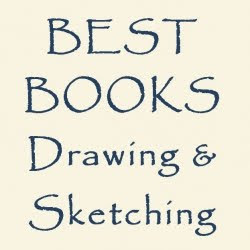 Also, since I realised that an awful lot of fine artists with really good design and composition skills started off working in design or illustration, I've also been interested in whether there are books about design which are also helpful to fine artists. There again - I love looking at fonts and books about type - I don't quite know why but I do! 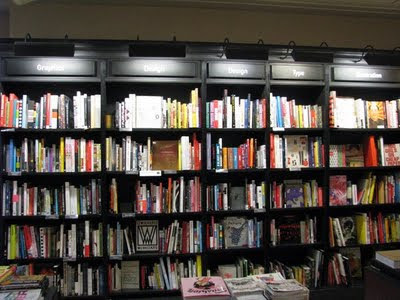 If you've ever wanted to explore books in these fields then the Waterstones in Garrick Street - half way between Covent Garden tube and Leicester Square is the place to go. There's also an entrance into the art section of the shop from Long Acre. 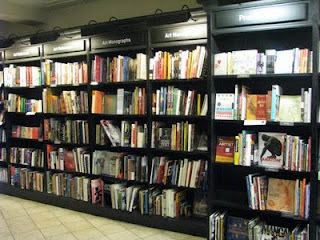 The Waterstones Art & Photography website gives a good indication of the sort of books they carry. 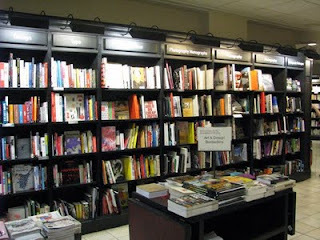 I've decided I'm going to create a Google Map of where all the good art bookshops are in London. If anybody wants to send in suggestions please comment below.